Generally we have what we’ve been given, and it’s up to us to do with them what we will. Instead of being defeated by circumstances and thinking that accepting what “is” as “enough” is a bad thing or that you’re surrendering to something, look at it as making the most of what you have been given and what you are able to do, not what you haven’t been given or are unable to do. It’s very easy to see acceptance as failure but it’s quite the opposite. 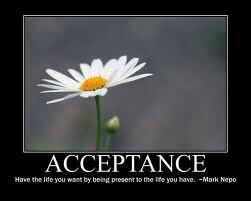 Many times, simply accepting things helps to avoid discouragement or the feeling that you aren’t enough. We can only do our best and be happy with that. Some expectations we put on ourselves just aren’t attainable, not because we aren’t good enough, just because we have simply reached our potential using what we have been given. You are enough, accept that! So who do you want to be? Where do you want to go? Might it be possible that you already have the necessary building blocks?